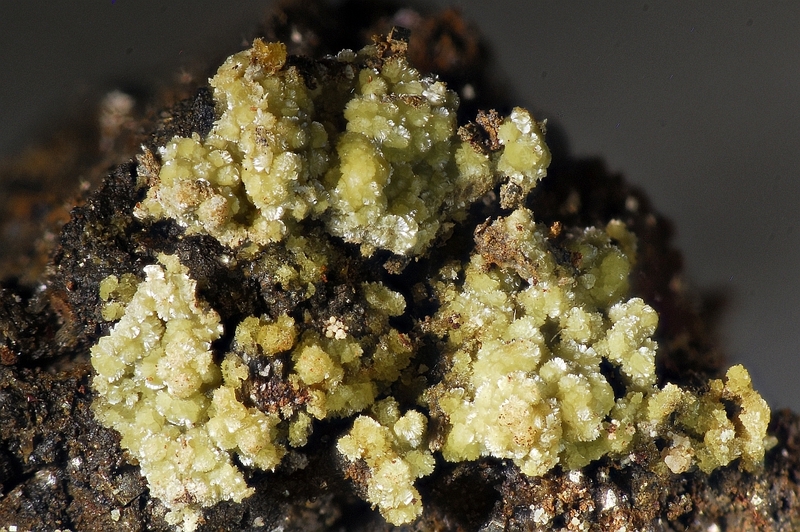 Hilarionite: Mineral information, data and localities. For the type locality, the Hilarion mine, Lavrion, Attica, Greece. Related to and easily confused with the ferric iron arsenate hydrate kaňkite. Spherulites; near-parallel or divergent aggregates of very thin, curved fibers. Space group C2, Cm or C2/m. 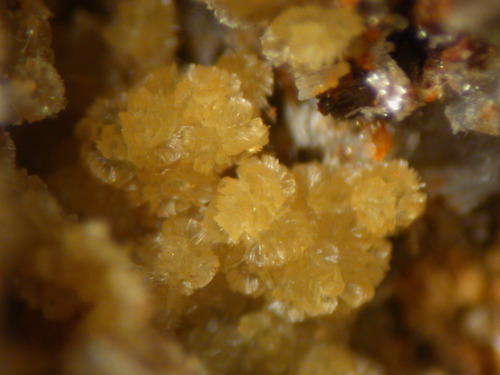 Spherulites (up to 1 mm in size) and bunches of prismatic to acicular «individuals» (up to 0.5 mm long) that are in fact near-parallel or divergent aggregates of very thin, curved fibers up to 0.3 mm long and usually lesser than 2 um thick. 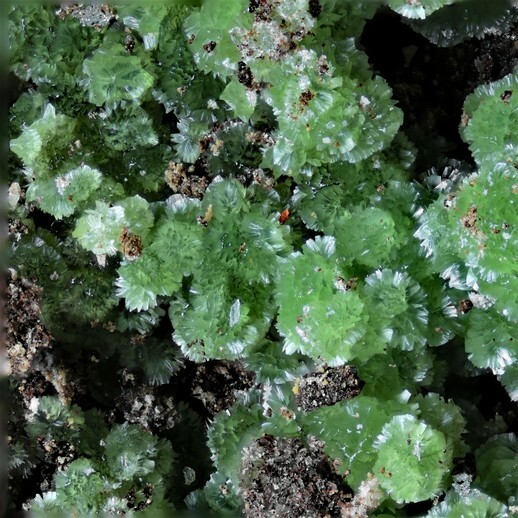 Type material is deposited in the collections of the Fersman Mineralogical Museum of the Russian Academy of Sciences, Moscow, Russia, catalogue number 92988. 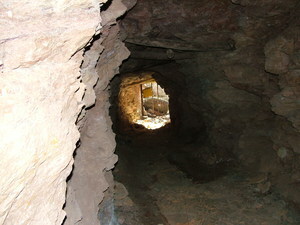 In the oxidation zone of a sulfide-rich ore-body. Pekov, I.V., Chukanov, N.V., Yapaskurt, V.O., Rusakov, V.S., Belakovskiy, D.I., Turchkova, A.G., Voudouris, P., Katerinopoulos, A. and Magganas, A. (2012) Hilarionite, IMA 2011-089. CNMNC Newsletter No. 12, February 2012, page 154; Mineralogical Magazine, 76, 151-155. Pekov, I.V., Chukanov ,N.V., Yapaskurt, V.O., Rusakov, V.S., Belakovskiy, D.I., Turchkova, A.G., Vuduris, P., Magganas, A., Katerinopolus, A. (2013) Hilarionite, Fe3+2(SO4)(AsO4)(OH)•6H2O, a new hypergene mineral from Laurion, Greece. Zapiski RMO: 142(5): 30-42. Pekov, I.V., Chukanov, N.V., Yapaskurt, V.O., Rusakov, V.S., Belakovskiy, D.I., Turchkova, A.G., Voudouris, P., Katerinopoulos, A. and Magganas, A. (2012) Hilarionite, IMA 2011-089. CNMNC Newsletter No. 12, February 2012, page 154; Mineralogical Magazine, 76, 151-155; Pekov, I.V., Chukanov ,N.V., Yapaskurt, V.O., Rusakov, V.S., Belakovskiy, D.I., Turchkova, A.G., Vuduris, P., Magganas, A., Katerinopolus, A. (2013): Hilarionite, Fe3+2(SO4)(AsO4)(OH)•6H2O, a new hypergene mineral from Laurion, Greece. Zapiski RMO, 142(5), 30-42.